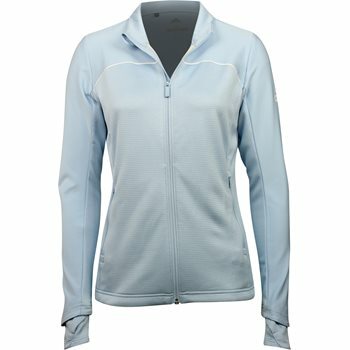 The adidas Go-To Women''s Golf Jacket is made with water-resistant fabric with fleece-lined shell for weather protection. The jacket is a full zip with a stand up collar. It also includes articulated elbows for natural movement and telescoped cuffs and thumb holes that help keep sleeves in place. adidas Badge of Sport heat transfer on shoulder.